In the wake of his #Peoplekind comment, a joke that "didn't play well out of context", The Evening Standard has provided a lookback on Trudeau's push for gender equality. Canadian Prime Minister Justin Trudeau is often applauded for his inclusive policies and forward-thinking approach in a world of patriarchal bureaucracy and upheld as the ideal in the face of the Trumps of the world. We like to say ‘peoplekind,’ not necessarily ‘mankind,’ because it’s more inclusive. Then, deputy Tory leader Lisa Raitt urging the prime minister to “person up” in an exchange in the House of Commons. That’s all it took to catch on in the Twittersphere. Cue the combined internet’s mirth, outrage and witty words. "We like to say Peoplekind." Um, who exactly is this royal WE? Radical feminists? Leftist ideologues? Deranged SJWs? Princess Trudeau is offended by the word “mankind” and wants people to use “peoplekind” instead. A made up word... At least go with “humankind” you dumb fool. Sorry for your culture-loss, Canada. Reaction went above and beyond this though, with some commenting on different tolerance for puns aimed at men and women. If Ridiculing a Woman is #Misogyny, then why isn't Ridiculing a Man #Misandry? Aren't people being too Intolerant towards Puns aimed at Women; while being OK with them, when Men are at the receiving end? According to the Evening Standard, the comment was not taken lightly. Some thought he was "mansplaining," some felt he was serious and politically correct, while others came to Trudeau's defence saying the comment was taken out of context. 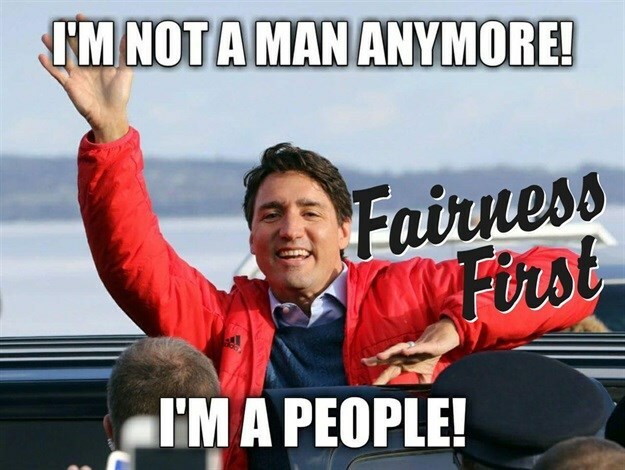 The US-right-wing pile-on re Trudeau's "peoplekind" is pretty misleading. Light-hearted sarcasm for the win, especially as Evening Standard reports gender equality has long been top of Trudeau’s list, having appointed a half-female cabinet – a step that has so far never taken place in countries such as the UK, the United States or Australia – he explained: "Because it's 2015." This resonated so strongly here in South Africa that we made it our ‘quote of the year’ for 2015. Trudeau took note and apologised in Ottawa this Wednesday for what he dubbed as his ‘dumb joke’ that went viral and didn’t play well out of context. #MeToo, #TimesUp, the Women’s March; these movements tell us that we need to have a critical discussion on women’s rights, equality and power dynamics of gender. Trudeau's California itinerary tomorrow/Friday: "diversity and equality roundtable" with tech-biz leaders; meetings with the CEOs of Amazon, eBay, AppDirect, Amgen; meetings with California Gov. Brown and Lt. Gov Newsom; speech at the Reagan presidential library. Evening Standard points out he vowed to finally put a woman on Canadian banknotes back in 2016, and when new banknotes go into circulation later this year, black civil rights activist Viola Desmond will appear on the Canadian $10 bill. Desmond challenged racial segregation in Canada as far back as 1946 when she refused to leave a ‘whites only’ area of the Roseland Theatre in New Glasgow, Nova Scotia. That’s what I call putting your money where your mouth is – literally.